Hello and welcome to day 4 of the My Favorite Things February release countdown. For the next 5 days, we're counting down to the February 2017 release, sharing cards and ideas using the new products. For today's card, I used the awesome new Space Explorer stamp set (and coordinating dies) to create a cute little space scene. I started off by diecutting a circle from a piece of masking paper and then I adhered the negative piece of the masking paper onto a piece of white cardstock. I used an ink blending tool and various colours of Distress Inks and added colour to the inside area of the circle. I started with my lighter colours first and then slowly built up the darker colours on top until I had it nice and dark with different shades of colour. Before I removed the mask, I watered down some white acrylic paint and then I splattered it on top to give the look of stars. 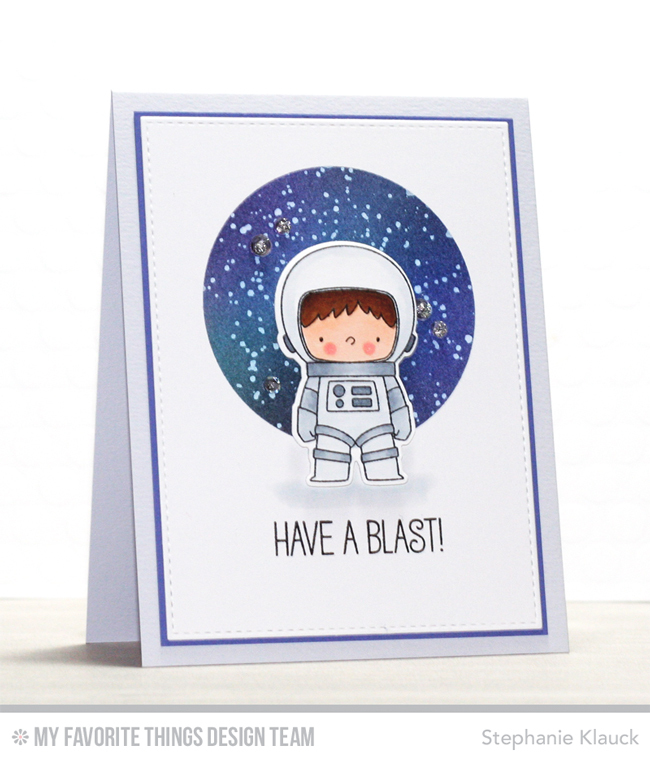 I stamped, coloured and diecut one of the adorable little astronauts from the stamp set and adhered him over the inked circle with foam adhesive for some added dimension. I stamped the sentiment below him with black ink and then I matted the panel onto a piece of Lavender Fields cardstock before adding it to a Stone Gray card base. Thanks so much for joining me for day 4 of the February release countdown. All of the new products that we're sharing all week will officially be available in the MFT online store at 9pm EST on February 7, 2017. I absolutely love how you used this cutie Stephanie. Very sweet card. Perfect for a little boy! 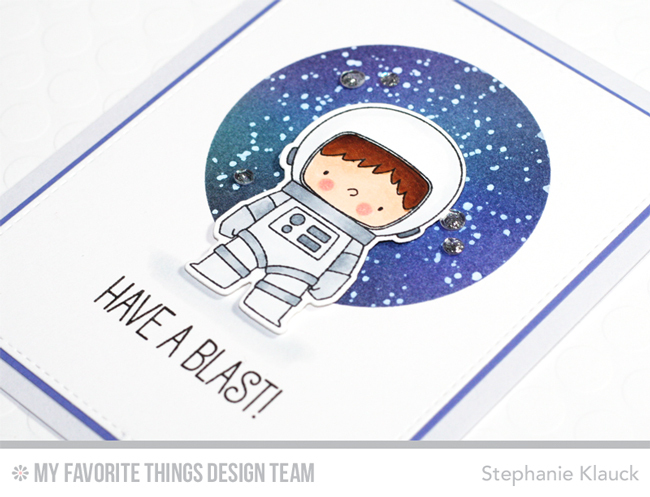 Such a great way to highlight the space background with the little astronaut! Great design! Stephanie, this is such a great card. I love the circle cut out behind the little astronaut, and the sky is colored and splattered perfectly! Thank you for sharing. Great Card. These space backgrounds are Awesome! FAB Card! You captured the awe of outerspace!